Here are some of my 2016 cruise photos from aboard Sapphire, my Rival 32. The boat is new to me and ideal for these waters. Here are some of the spots. 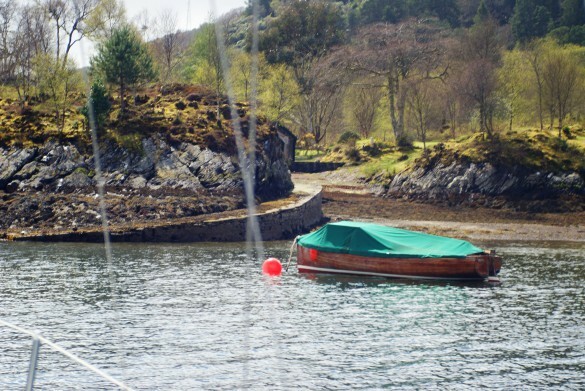 Below: East Loch Tarbert - fishing, tourism and retirement village. 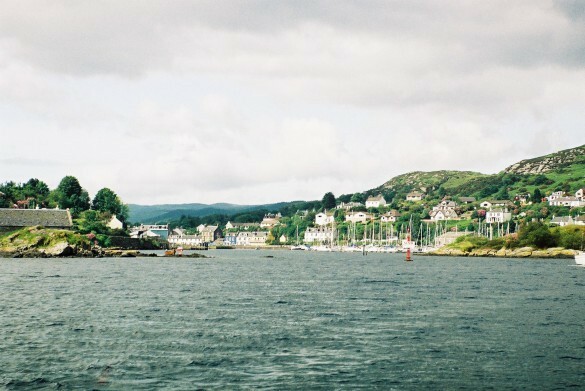 Below: East Loch Tarbert approach from East. 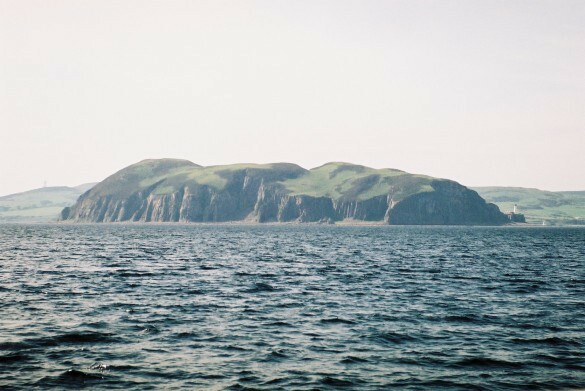 Below: Sanda Island is just off the turn of Mull of Kintyre. (aka Paul McCartney song. 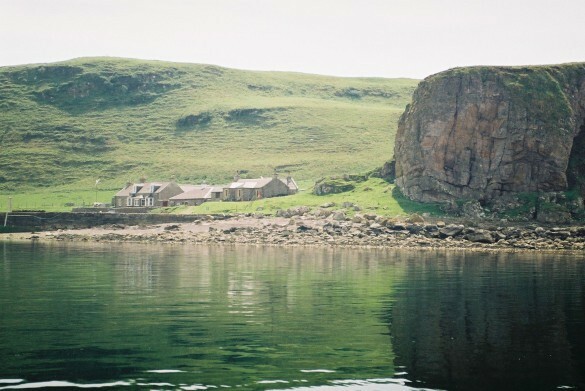 He had/has an estate on Mull of Kintyre).Sanda Bay was where the Viking raiders (ancestors of mine?) anchored before they raided the settlements of the Firth. 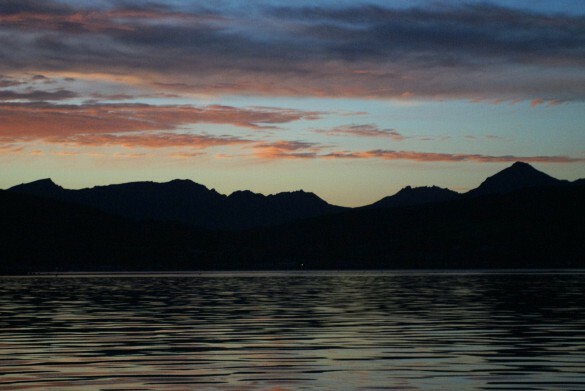 This is the inner harbour from west, near anchorage. Below. Arran Holy Isle approach from east. 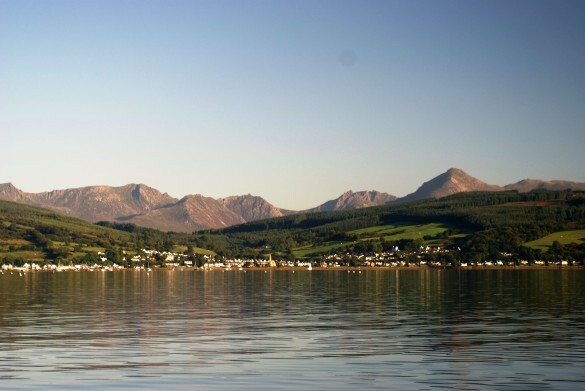 Below: Lamlash village on bay north shore on Isle of Arran. 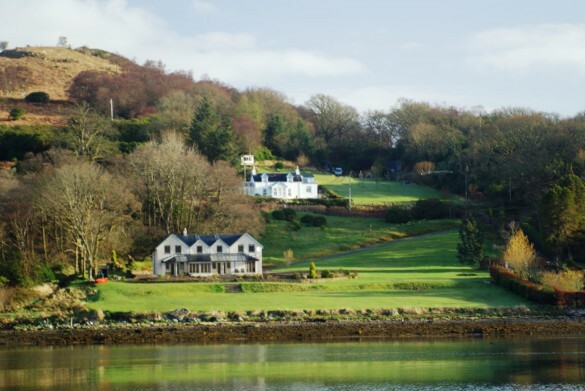 Below: Buddhist Retreat House on NW Holy Isle in Lamlash Bay. 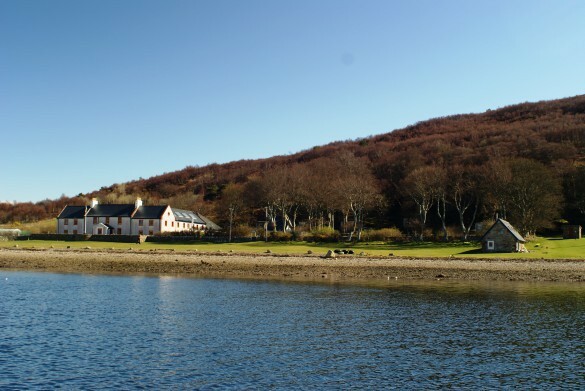 When the Buddhists bought the Holy Isle (way back it was a monastery and then private ownership), some locals of Lamlash village on Arran raised serious concerns about a foreign religion operating so close to them. The Buddhist master was asked what he thought of their concern. His reply, "If their faith is strong, they have nothing to fear." Good holding in pebble and kelp in about ten metres. Sheltered from east but open to west and south. 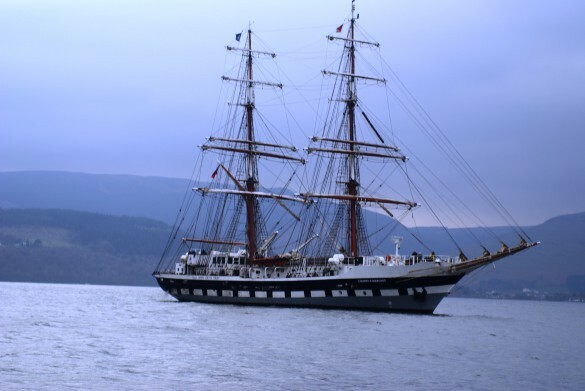 Below: Stavros Niarchos - a sail training vessel. 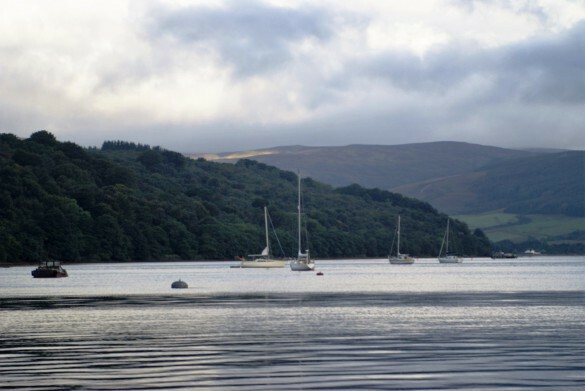 Below: Kyles of Bute, the pastoral channels with farms and holiday homes. 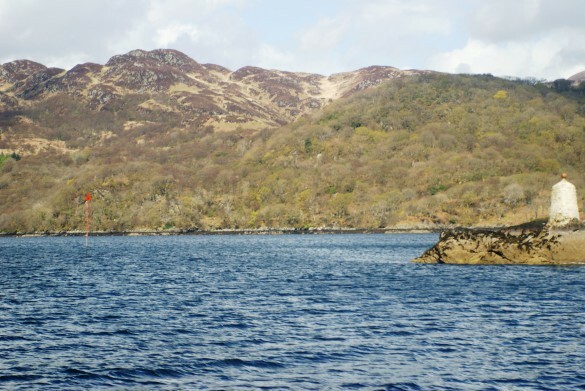 Next are of Caladh Harbour, a very beautiful and very tight rocky spot with old stone dyke jetty as a spiral to fit the tidal range daily of some 3-5 metres. 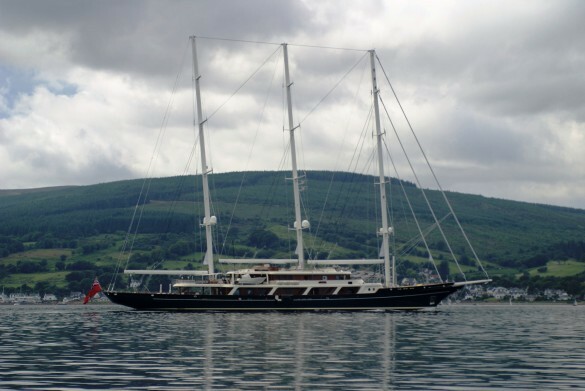 I had a shocking night anchored here when the south wind hit 47 knots. If the anchor had dragged I would have hit the rock walls in seconds. As it was the boat was bucking like a rodeo horse. Harbour is good in north wind or west or east but very large surge in south gale... surprising me. Surge was coming up funnelled from the West Kyle. North entrance: narrow and not for me. See red beacon and rock is at high tide. 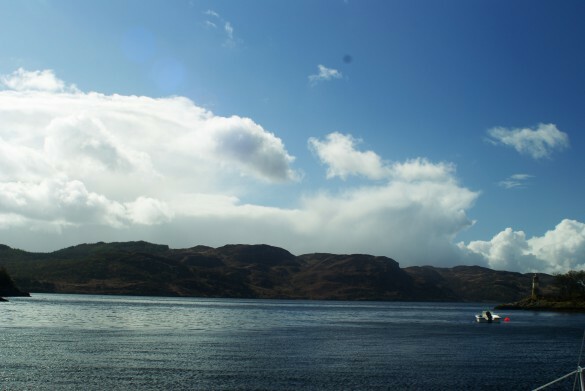 Above is from inside Caladh harbour looking to south entrance and much easier and safer. 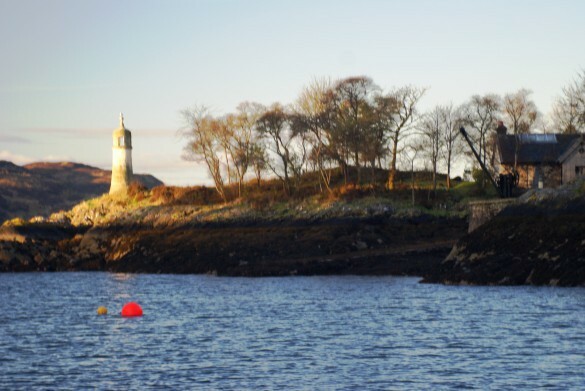 Below: Caladh harbour south entrance west side tower. 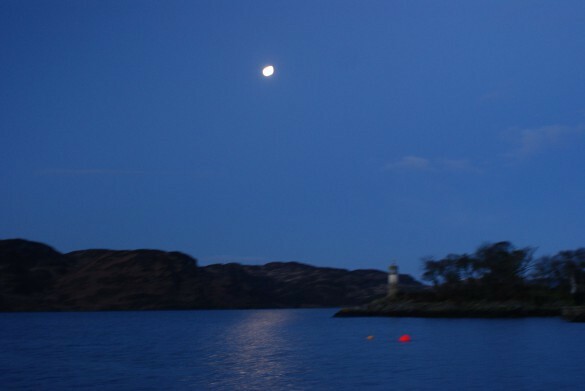 Caladh harbour again. Lovely varnished launch and the spiral stone tidal range jetty. 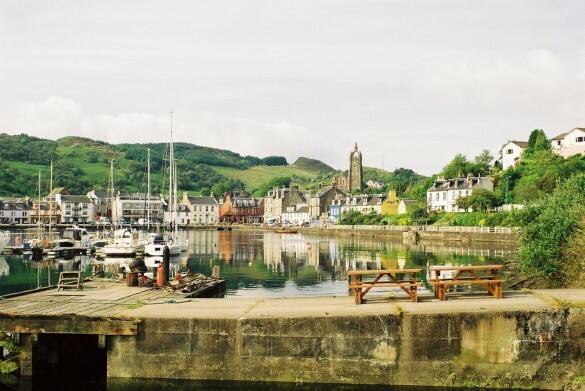 Harbour was a fishing village at one time. 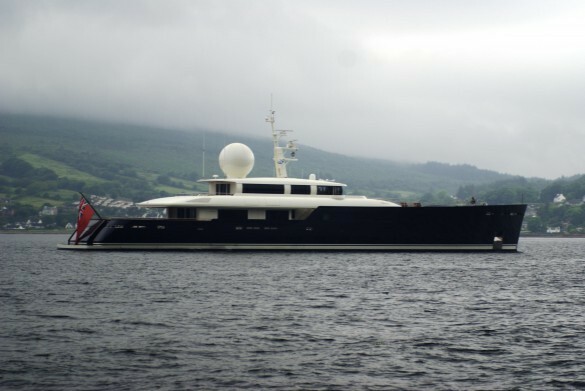 Below: Next is an oligarch superyacht which showed up in Lamlash Bay. I can only think they had cars in this huge hull. There was a large stern ramp. Below: Next huge superyacht. No name just a tax haven flag and rumour was that it was 'owned' by President Paramount Pictures. 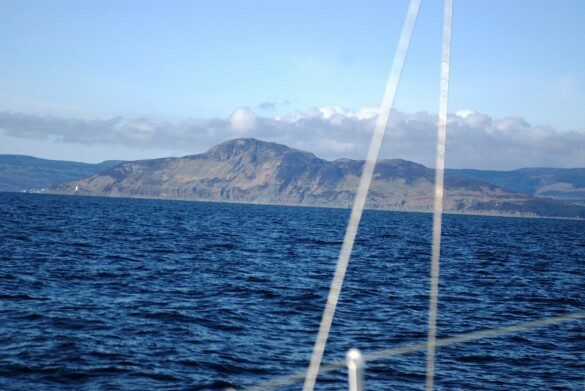 Below: South east exit of Lamlash Bay, Holy Isle. 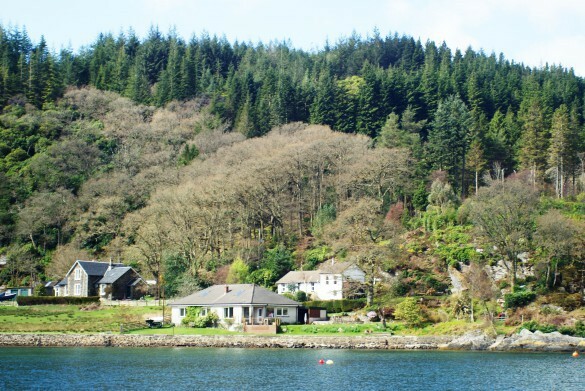 here is the other part of the Buddhist retreat with special wee cottages for some Buddhist women who have been in solitary meditation for two – four years…. 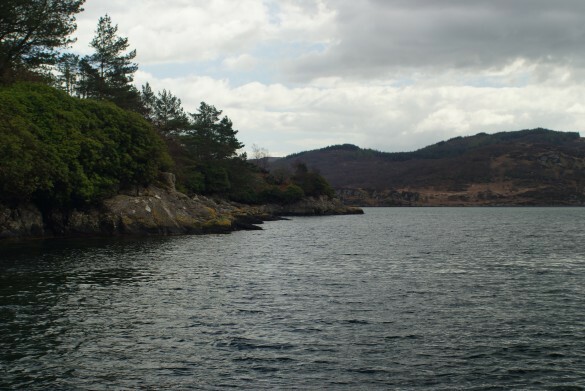 Below: South east exit Lamlash Bay Arran: This shot looks boring with yacht at mooring but looking out into the Firth, there is a Trident missile sub coming back from patrol. 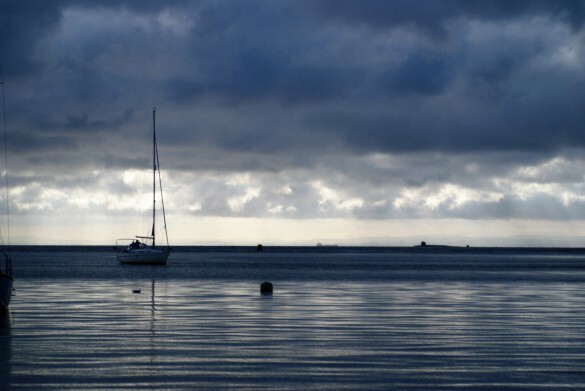 Below: Moody shot of Lamlash bay. 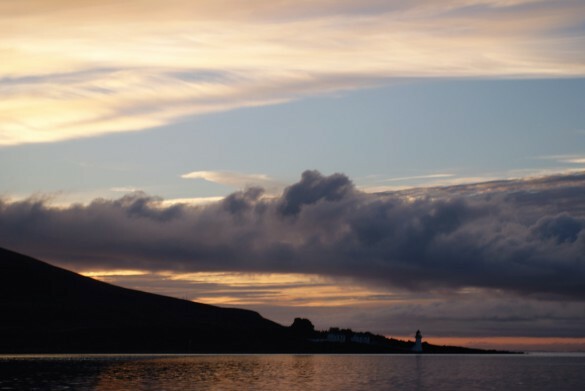 The pinpoint of light is the first light of Lamlash village. They don't put lights on until really dark. Below: Kingscross anchorage. 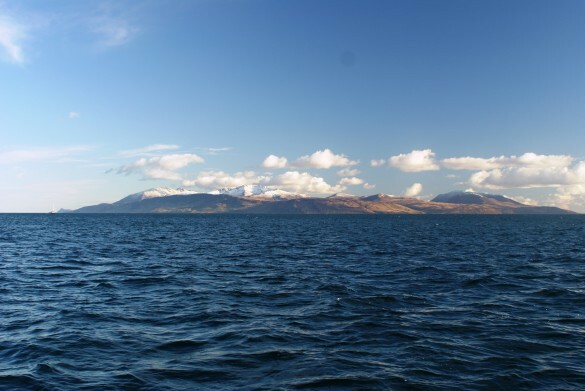 Southshore Lamlash Bay near fish farms looking westerly. Sheltered from south by hillside and treeline. Good holding but not a good leeshore. 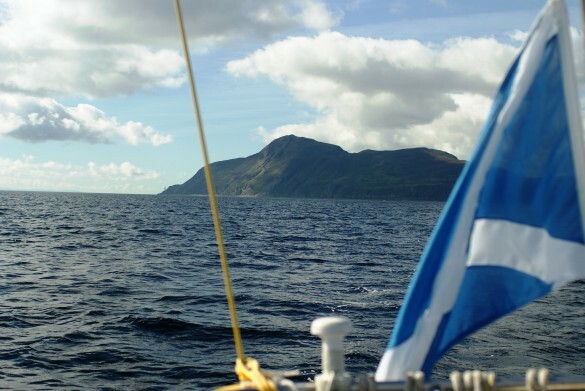 Leaving Arran Holy Isle headin back east to Clyde Marina Ardrossan. A good first season and some real rain and winds not shown here. 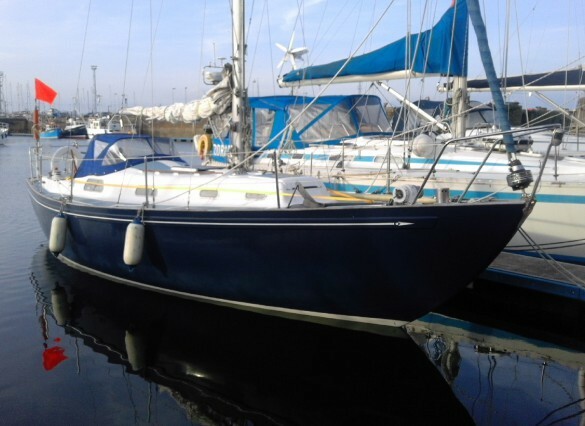 The Rival 32 had excellent handling characteristics and a real pleasure to own and sail.